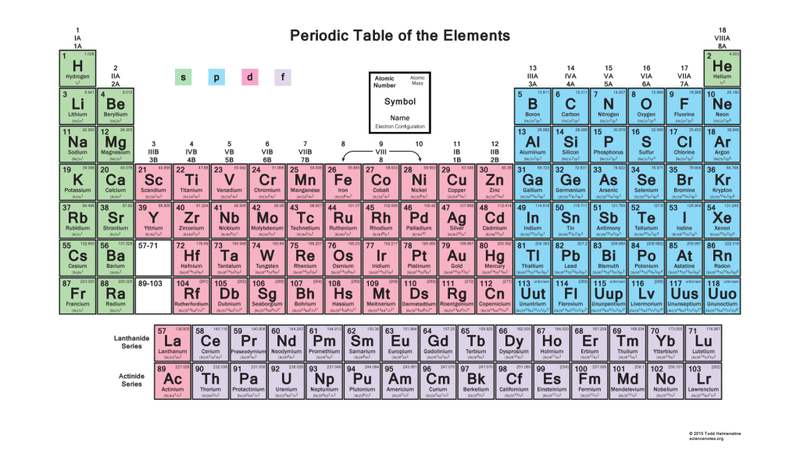 This periodic table contains each element’s atomic number, symbol, name, atomic weight and electron configuration. It is a periodic table showing shells of the outermost electron orbital. Each lightly colored cell highlights the block of the outermost electron. Block s elements are green, p is blue, d is pink and f block elements are purple. This table is useful to illustrate why the periodic table is shaped the way it is. This table is 1920×1080 pixels in dimension and suitable as a HD wallpaper for widescreen devices. Click the image to view full-size. If you would like to print this table, download the PDF and select Fit and Landscape as your print options. The results are quite readable on an 8½ x 11 sheet of paper. Download and enjoy! Be sure to check out our other periodic table wallpapers. Thanks for these beautiful images of the periodic table, I’ll proudly wear them on my chest!